The past few years saw a dramatic turning point for Asian stars as they land bigger roles and get a better representation on television. Last year was particularly great for actresses of Asian descent portraying strong inspiring roles that break away from stereotypes. But this year and the next are also seeing major screen time for Asian stars especially Asian-American Lucy Liu and Asian-Canadian Jadyn Wong, who are returning to primetime television for their respective roles in Sherlock Holmes adaptation Elementary and action drama series Scorpion. 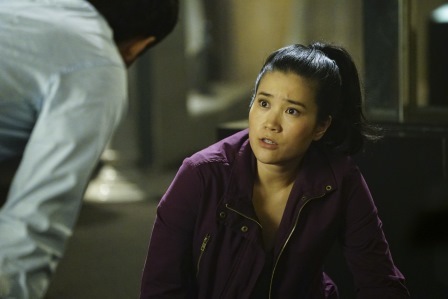 Liu plays Dr. Joan Watson, the world-famous fictional detective’s assistant reimagined as a woman, and Canadian actress Jadyn Wong plays Happy Quinn of Team Scorpion, whose mission is to neutralize complex, high-tech threats around the globe. In both shows, the two stars not only demonstrate how female wit, grace, and courage put women at par with men when it comes to dealing with danger, they also show that Asian stars can perfectly fit complex roles that they do not often portray on screen. Elementary, which is now on its fifth season, shifts the world of Baker Street from Victorian England to modern-day Manhattan. The show has also turned Dr. Watson into a female character that stands as Sherlock Holmes’ peer, not his assistant. While a female Dr. Watson seems to open the possibility of romance, Liu’s character is anything but a potential love interest. Instead, she proves that her intellect, along with her temperament, is a first-class match to Holmes‘ deductive prowess—capable of solving crimes just as skillfully as when she was performing surgery. On top of these, she shows that a tough female can also be stylish. In the past four seasons, Dr. Joan Watson has helped Holmes solve one crime after another. The fifth season, which premiered last October, began with Watson helping Holmes untangle dangerous twists surrounding a deadly explosion. While there can be no doubt that the duo will solve any crime thrown their way, how they put their wits to work is a must-watch in the episodes to come. Jadyn Wong once said that working with a male-dominated cast was like bathing in testosterone. That’s how it went when her character Happy Quinn used to be the sole female member of Team Scorpion. Still, Happy ‘ability to think fast has made her a welcome member of the lineup. In the episode “Little Boy Lost,” she thwarts a murder plot thanks to her quick wits at solving dangerous puzzles. Work at Team Scorpion may already be a handful for Happy, but even her personal life has tough battles to throw her way. In the episode “Fractured,” Happy gets into a romantic affair with Toby Curtis (Eddie Kaye Thomas), who happens to be one of her best friends. Though the relationship starts out rough, Curtis ends up wanting to marry her. Unfortunately, he gets abducted before giving his proposal. Scorpion’s on-going season reveals not only Happy’s secret past but also a new chapter in her life: motherhood. Will she find balance between her newfound family life and the dangers she faces with Team Scorpion? With Lucy Liu and Jadyn Wong making waves with their tough and complex roles, it seems that Asian stars on television are at an all-time high. RTL CBS Asia Entertainment Network is a venture of two of the world’s largest content producers: RTL Group, a global leader across broadcast, content and digital, and CBS Studios International, the leading supplier of programming to the international market place. The Network has two channels: the general entertainment channel, RTL CBS Entertainment HD and the male-skewed entertainment channel, RTL CBS Extreme HD. Both channels are widely distributed in the Asia Pacific and are localized in five languages.